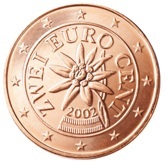 Austria was one of the founding members of the Euro zone and started minting coins in 2002. Some basic facts relating to Austria. 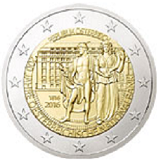 Austrian Euro Coins offer a variety of interesting themes and tell an interesting tale of conforming to EU requirements! Austrian Euro Coins have in effect eight different motifs but has grouped these into three main themes. The first group (1,2 and5 cent coins)is of Austrian flowers. The Enzian - from the roots of which, by the way, a very good Schapps (spirit) is made. The Edelweiß - A small white flower appearing in the mountains and made famous by the musical "The sound of Music". 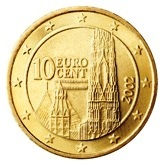 The second group (10,20 and 50 cent coins) is of famous buildings in Vienna. The Secession building in Vienna. The third group (1 and 2 Euro coins) is of famous Austrians. The latter is, I think, only famous in Austria - I , at any rate, have only heard of her thanks to the Euro Coins!! 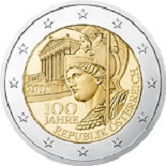 All Austrian coins show the value of the coin as well as a representation of the Austrian flag on the national side. The original guidelines required that all the national sides contain no reference direct or indirect to the country issuing the coins - hence the appearance of the Austrian flag was against these guidelines. But the story has not yet finished. The new guidelines of 2005 now expressly require a clear reference to the issuing country to appear on the national side! Austria was now, regarding the appearance of its flag on the national side, in accordance with the guidelines. 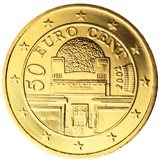 The new guidelines of 2005 also required that the value of the coins do not appear on the national side. So poor old Austria was now in violation of this requirement. It is expected that in the near future the Austrian national side will be re-designed to accord with this new requirement. If there is any reason why the value should not appear on the national side, I have not yet heard of it. Decisions made by bureaucrats, however, are like the laws of quantum physics - perhaps known but never really understood! 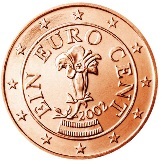 1 cent - The Enzian flower together with a symbolized Austrian flag at six o'clock. 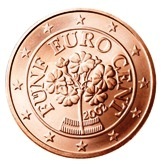 2 cent - The Edelweiß flower together with a symbolized Austrian flag at six o'clock. 5 cent - The Primrose (Schlüsselblume) together with a symbolized Austrian flag at six o'clock. 10 cent - St. Stephans Cathedral dating from around 1160.The Austrian flag appears under Cent. 20 cent - Belvedere Palace - the state treaty establishing the sovereignty of Austria after the war was signed here. The Austrian flag appears at 6 o'clock just above 2002. 50 cent - The art museum -Secession Building.This represents the start of art nouveau and a new start in the country. The Austrian flag is at 3 o'clock. 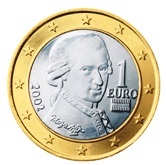 1 Euro - Wolfgang Amadeus Mozart - perhaps the most famous Austrian of them all! 2 Euro - Bertha von Suttner - a pacifist and nobel peace prize winner. 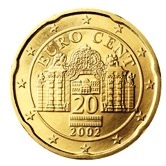 Around the rim of the Two Euro Coin appear "2 Euro" (4 times) alternating with three "*". 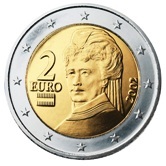 Each "2 Euro" is inverted with respect to the preceding and following "2 Euro"
Austrian Commemorative Two Euro Coins. Austria has, I am afraid, been quite parsimonius with the issue of commemorative coins. It has to date issued only three of its own. 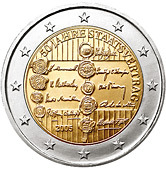 2005 - 50 years State treaty (Staatsvertrag) - the coin shows a reproduction of the treaty signed in 1955 which in effect gave birth to the new post-war Austria. 2016 - 200 years of the Austrian National Bank - the coin shows a portion of the stone relief over the National Bank. Two Roman Gods are shown - left Mercury and right Fortuna. Return from Austrian Euro Coins to Links to Specific Countries. Return from Austrian Euro Coins to euro coin collector.